Let's talk about the Bengalis, they faced similar tragedy like the Biafra people, I think there as a lot to learn about this special people, they succeeded in liberating the Indian people and India nationalism. For 442 years, the people of India experienced diverse kinds of ruling from Colonial masters, Portuguese, and Britain. Britain were the last set of rulers before the India Nationalism. British Empire ruling lasted for 335 years (1612–1947). Note that; during the British rule, other rulers were the Portuguese ruling ongoing in some distinct parts of India that ended in 1633 and the colonial French ruling that ended in 1954 with the French colonies in India. The British Empire were the chief rulers of India, they controlled the India people, make the rules and the Indians only but obey. More often, anyone that dared opposing the maltreatment, and the callousness of the British Empire faced death or severe punishment as penalty. Notably, the hanging of 18-year-old revolutionist; Khudiram Bose when the India Nationalism was gaining momentum and the hanging of eighteenth-century Veerapandiya Kattabomman who struck against the British Empire. The British Empire aside exploiting and ruling the people of India, sold their produce to Indians, clothes, sugar, cotton and other foreign goods, their culture and religion in exchange for Indian resources. The India people after enduring the ill treatment by the British Empire couldn't bear it any longer, they started fighting for their rights and demand that they be allowed to rule themselves. Of course, you wouldn't expect the British Empire to succumb to these demands, so they responded with series of heinous strategy like killing and punishing those seeking for justice. The British Empire foreseeing the resilient spirit and the determination of the Indian people, they knew force alone wouldn't do, they came up with lies of over population and religious differences which they claim could result to violence and also making governance poor, so they started partitioning regions they consider as the nerve centre of the Nationalist Movement. Bengal was one region that had high population; their population as at that time was seventy (70) million. The Bengalis were chiefly Muslims and Hindus. Aside the high population and multi-religion, something scared the British Empire that intense the need to divide Bengalis, and what's that? Bengal being the nerve centre of the Indian nationalism. The Bengalis were among the India majority, they were at the forefront of the Nationalism movement, they were influential, industrious, brave and fearless and most importantly, they were the potential consumers of British imports. The Bengalis made British business thrive, they loved British goods and extremely utilize them. The Bengalis provided the richest market in India. So British Empire fear the diehard freedom spirit of the Bengalis and knew these people had to be divided else they'll lose out on all if they become independent. You won't be mistaking if you would liken the Bengalis to the Igbo Biafran people trapped today in Nigeria. A MOMENT: The Bengalis were at the forefront of the struggle, they weren't perturbed about this fact, they did not relent nor wait until the whole India agree to join the movement for freedom. Hope you are actually getting it or seeing the big picture? Let us get going! The British Empire came up with the 'Partition of Bengal' in 1905. They claimed the partition was for the good of all but actually it was political and what you will likely call 'Divide and Rule' tactics. The proposals of partition of Bengal became public in 1903 while the decision of dividing Bengal was declared by Curzon on July 19, 1905. The division of the Bengal Presidency, took place on October 16, that year into largely Hindu western areas of Bengal that presently constitute the Indian states of West Bengal, Odisha, Bihar and Jharkhand; and the largely Muslim eastern areas of East Bengal and Assam. Such division of Bengal meant that the British not only thrived in dividing Bengal on the basis of religion by separating the Bengali Hindus and Muslims but also succeeded in restraining the Bengali influence in India’s freedom struggle by reducing the Bengalis into a minority in the Hindu western areas of Bengal with around 37 million Oriya and Hindi speaking people compared to 17 million Bengalis. GET THIS: The strategy of partition is not too dissimilar with what happened in Biafra, the British painstakingly grouped the Igbo speaking people together in to a region while ceding away a handful to other regions, and grouping Ijaw with Urhobo, Efik, Ibibio and others, to bring in minority mindset. They also, like in the case of separating Hindus and Muslims; separated oil producing States and called them Niger Delta. Without knowing, the leaders of Bengal and of the Nationalist movement understood the malicious intent of British Empire and the effects of the division on both the peace of the Bengalis and also to the journey to 'Self Rule'. So, they objected the idea of partitioning Bengal with all vigour. When the British Empire insisted on the partition, the Bengalis resorted to protest, appeals, petitioning and also violence. They violently engaged British Empire and you would not need a fortune-teller before knowing Bengalis would not be able to defeat Britain violently but they did try and did their very best. Listen, in the course of rejecting the partition, the second and most effective Swadeshi Movement (1905) was birthed. It was a movement that changed and liberated the India people. It was a movement that fought the removal of tyrants and callous white-men and demanded self-rule for the India people. The Bengalis, after failed attempt to violently surmount British Empire, developed a new and effective strategy. The One strategy the Bengal folks used that really struck a BIG deal on the British Empire was Boycott: I mean the Most Powerful Social Weapon. The Swadeshi Movement was formally proclaimed at a meeting held at the Calcutta Town hall on August 7, 1905 where the Boycott resolution was also passed. Suggestion for boycott was first given by Indian freedom fighter, leader of the Brahmo Samaj and journalist Krishan Kumar Mitra. He openly called for boycott of foreign goods through his journal Sanjivani on July 13, 1905. The boycott movement was undertaken by the Bengalis after employing different other forms of constitutional agitations including petitions, vocal protests and conferences. The objective of boycott movement was to cripple the British economically by boycotting British goods, especially the cotton goods from Manchester the richest market for which in India was Bengal. This would result in pecuniary losses for the colonial rule thus creating pressure on them. Another purpose behind the movement was to revive the comparatively nascent Indian industries so that they can grow and sustain while facing free competition with highly developed industries of foreign countries. The economic strategy of the movement was to revive domestic products and production processes by boycotting use of British products with the objective of protesting against British rule and establishing self-rule in India. Down in Biafra, IPOB body is using sit at home and election boycott for now. Spontaneous and sporadic protests across Bengal gradually took shape of Swadesi (“buy Indian”) movement. British products were boycotted, people pledged to use Indian goods, shops selling foreign goods were picketed, western clothes and other products were thrown on bonfires and imported sugar was boycotted. Bombings took place in public buildings; armed robberies were staged and British officials were executed by group of young men. British law and British courts were boycotted. They also boycotted British educational system as children were prohibited from attending British Schools. Everything foreign was boycotted, no matter how valuable or essential. The boycott idea wasn't an easy one for Bengalis as they faced all form of opposition from British Empire and most times forcefully. Students that complied were expelled and teachers relieved of their duties. In fact, Swadeshi movement had to last for 97 years. Positive & Negative Aspects of the Swadeshi Movement. Positive Aspects: On the positive side the Indian industries saw regeneration with reawakening of use of indigenous goods. Demand of native products including clothing increased. The Bombay and Ahmadabad mill-owners endeavoured in filling the sudden shortage in supply of clothes due to the boycott movement. The cotton mills of India straightaway got an impetus of fostering the industry, thanks to the Boycott movement in Bengal. However, such situation was also taken advantage of by mill-owners as according to sources the Bombay mill-owners heavily cashed in on the ‘Bengali Sentimentalism’ of buying only Indian clothes, thus making huge profits. The once prospering weaving industry of Bengal that was destroyed by the British after they started ruling the province from the 18th century also started supplying clothes, however not so fine handloom products, to meet the sudden increase in demand. The Bengalis nevertheless accepted the coarse clothes wholeheartedly with complete sincerity and commitment towards the Swadeshi Movement. A song pleading people to honour and accept the coarse clothes offered by the poor Mother who does not have means to provide better clothes to her children became very popular across the nation inspiriting Indian nationalism. Several textile mills, soap factories, tanneries, shops, match factories, insurance companies and banks among others were also set up which were based more on the spirit of nationalism rather than on the mind set of doing business. Negative Aspects: The British faced the negative side of the Swadeshi movement, which was of course the very purpose of the movement. The foreign goods including clothing, sugar, salt and various other luxury items were not only boycotted, but they were also burned. Campaigns continued including performing occasional bonfires of foreign goods, conducting processions, singing popular songs and publishing articles in newspapers in pursuit of keeping the light of the Swadeshi movement ignited. Volunteers were enrolled to keep a strict vigil and fines were imposed on those found using foreign sugar, while Brahmins denied assisting in conducting pujas and ceremonies in house of those who used European salt and sugar. Warnings were given to the Marwaris so that they refrain from foreign articles import. The Swadeshi movement also led to social boycott of not only buyers but also sellers of foreign goods. Those who opposed the movement or in any way helped the Government in repressing the movement were also boycotted and ostracised socially. Negative Impact: The students who supported Swadeshi and boycott movements faced stern and violent actions from the British Raj. Circulars were given that those students found involved in the boycott movement in any way would face severe penalty. The students were also warned to refrain from giving voice to the slogan ‘Vande Mataram’ in public places which would also amount to punishable offence. Even the schools and colleges were not spared from such warnings as these institutions were alarmed that if their students defy such orders then Government grants would be withdrawn and the institution may also lose affiliation while their students would be proclaimed ineligible for Government Service. Instructions were given to authorities of such institutions to be vigilant on their students and to report names of disobeying students to the Education Department so that strict measures can be taken against them. It was also conveyed to the teachers and other management staffs through the magistrates that if required they would be commissioned as Special Constables. The principals of colleges were directed to show causes by the Direction of Public Instruction for the reason of non-expulsion of students who participated in picketing. The teachers who refrained from whipping the boys were asked to resign. Compare this to what Biafran students are suffering in Nigeria. Now see what will happen should Biafrans stand their ground as the Bengalis did. Positive Impact: Such measures only gave rise to resentment across the country and were sternly censured by the Indian-owned Press. It was taken up as a challenge by the Bengalis and college students of Rangpur disobeyed the orders of the Government while their guardians refused to pay the fine and instead established a national school for the expelled students. The students then protested the action of the authorities by boycotting the Calcutta University that was tagged by them as Gulamkhana that is a place where slaves are manufactured. On November 10, 1905, a conference was held that was attended by many prominent personalities of Bengal from different occupation or position within the society. There it was resolved to set up a National Council of Education so that a system of education can be arranged which will be under national control. The National Council of Education was established on August 15, 1906. Bengal National College was established and Aurobindo Ghosh was inducted as its principal. Rapid establishment of several national schools and colleges across the nation was witnessed during this time. In pursuit of parting technical education, a Bengal Institute of Technology was established and funds were raised so that students can be sent to Japan for advanced learning. The way the inspirited Bengalis from both parts of divided Bengal acknowledged the cause of national education and countered the repressive measures of the British only fostered the idea of the Swadeshi movement which by such time thrived in spreading its wings across the nation. Do you see now that power belongs to the people? Biafrans let the Biafra revolution begin in all sectors of our lives! The police roughly handled and lathi charged the volunteers of the Swadeshi and boycott movement, even in cases where peaceful picketing and protests were conducted. Students were forbidden to take part in the movement with threatening of dire consequences; uttering Vande Mataram in public places was made illegal; processions and meetings were banned; rural markets were dominated; leaders were imprisoned sans any trial; and attempts were made to stir up the loyal Muslims against the rebellious Hindus. In some way the British thrived in separating the very essence of Bengal on the basis of religion. Eventually the elites from the Muslim community met the new viceroy, Lord Minto in 1906 and sought for separate electorates for Muslims as also proportional legislative representation. The All Indian Muslim League political party was founded in December 1906 during a conference hosted by Nawab Sir Khwaja Salimullah held at Ahsan Manzil, the official residence of the Dhaka Nawab Family in Dhaka (presently in Bangladesh). Although such Hindu- Muslim Divergence was opposed by prominent Indian freedom fighter Mahatma Gandhi, the seed of the “divide and rule” policy sown by the British already started germinating and only developed with time. There was a steep decline in import of British products in the first couple of years or so, especially with respect to cloth. Several secret revolutionary organizations that were resolute in countering the Government came up during this time. The movement that was initiated as a mere boycott of foreign goods with time became widespread across the nation evolving as an integral part of the greater movement, the Indian independence movement which led complete freedom. Emphasis was given on self-reliance or Atma Shakti thus asserting on national dignity, honour and confidence and with such mind set several Indian enterprises, organisations and institutions came into being. The Swadeshi movement led the people to learn to challenge and disobey the British government explicitly without fearing the atrocities of the police and imprisonment. Even an ordinary man didn’t shy away from showing his love and respect for his motherland and resentment over the British rule. The Bengal province this time was divided on linguistic ground instead of on religious ground. Rapid establishment of several national schools and colleges across the nation. GRASPS; the Bengalis didn't wait until the whole India agreed to boycott, they did it alone because of their love for freedom. Permit me to say, the love for freedom was actually contagious and the rest parts of India did contract it. Also, what are you doing to ensure the boycott in Biafra is successful? Indians peddled pamphlets, what about YOU? Dear readers, one thing wouldn't stop to amaze me and what's that? How did the Indian people cope? Actually, how were they able to resist the sweetness, attraction and captivation of these foreign goods? This wasn't election that probably wouldn't make you lose sleep. I learnt how white men in the 90s even hitherto were treated as demigod, how come poor Indians that should be enraptured at the sight of foreign fascinating products were able to boycott them? Slowly and calmly imagine its attractiveness NOW and compare it with THEN, can you feel the determination? The products made by Indians wasn't even attractive or suitable but they made the hard choice, and paid the price for freedom. Violence, protests, appeals, and petitions couldn't save Indians BUT they employed the most powerful social weapon and guess what? It was worth it! The India people achieved their aim of self-rule and unknowingly developed themselves to face hard times; due to boycott strategy. Indians were forced to be creative, to be industrious and today, the rest is story! Do I have to reiterate that boycott is indeed a powerful weapon? It's so pathetic some people fail to realize the effectiveness of boycotting, probably they don't even understand their predicament, they don't even know they're glued with slavery. I wonder if they are suffering from a kind of jinx or something. 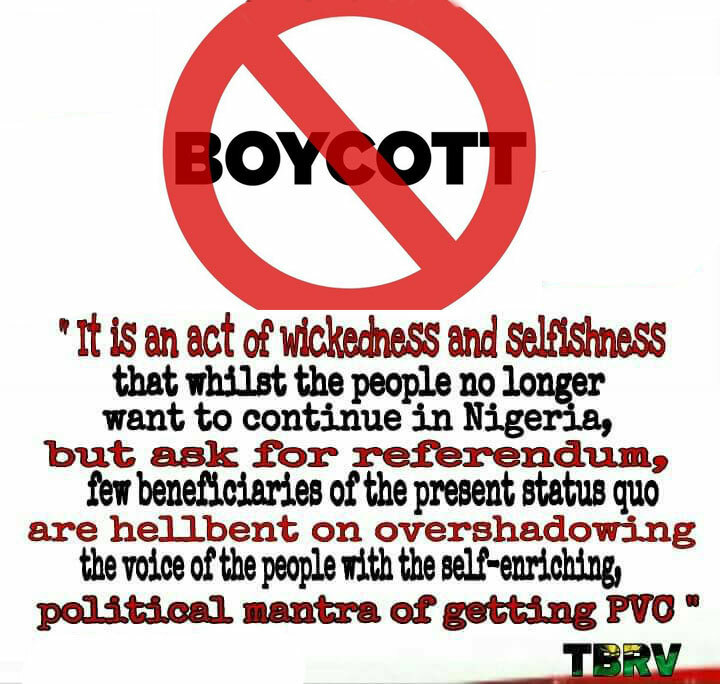 For Goodness' Sake, boycotting election wouldn't make you lose a sleep! Would it? Listen Biafrans, participating in Nigeria Elections isn't too dissimilar from having pleasure and ecstasy from slavery, it is like saying you are a comfortable slave. Seriously, there are lots to learn from the Bengalis, they knew what mattered most, they knew their freedom mattered more than those foreign attractions. Permit to ask; what matters most to you as a Biafran? Nigeria Election or Freedom?